Cultivating peace and clarity of mind through Chan practice. 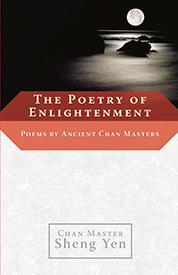 Founded by Chan Master Sheng Yen and published quarterly since 1977, Chan Magazine contains lectures by Master Sheng Yen and other Chan teachers, translations of Buddhist texts, scholarly studies in Buddhism, practitioner’s retreat reports, poetry, and more. Access current and past issues on the Chan Meditation Center (CMC) website. To subscribe to the paper version of the magazine, send an email to chancenter@gmail.com and specify “Chan Magazine Subscription” in the subject line. Published periodically from 1979 until 1997, the Chan Newsletter is a treasure trove of articles of interest to the Chan practitioner. It is available on the Chan Meditation Center (CMC) website organized by subject and by issue. 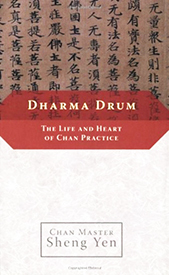 If you buy a book from Amazon via our website, Dharma Drum Retreat Center (DDRC) will receive a small portion of the book price. To purchase any of the books listed below from Amazon, click on the book cover. This is an inspiring guide to the practice of Chan (Chinese Zen) in the words of four great masters of that tradition. It includes teachings from contemporary masters Xuyun and Sheng Yen, and from Jiexian and Boshan of the Ming Dynasty (1368-1644). Though the texts were written over a period of hundreds of years, they are all remarkably lucid and are perfect for beginners as well as more advanced practitioners today. All the main points of spiritual practice are covered: philosophical foundations, methods, approaches to problems and obstacles-all aimed at helping the student attain the way to enlightenment. 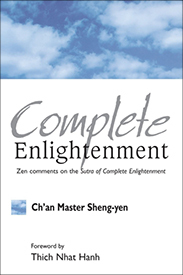 Complete Enlightenment is the first authoritative translation and commentary on The Sutra of Complete Enlightenment, a central text that shaped the development of East Asian Buddhism and Chan (Chinese Zen). The text is set in the form of a transcription of discussions between the Buddha and twelve enlightened beings (bodhisattvas), who question him on all aspects of spiritual practice. 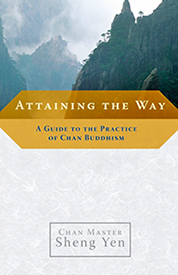 Here is an ideal guide to the practice of Chan Buddhism by a great modern teacher. 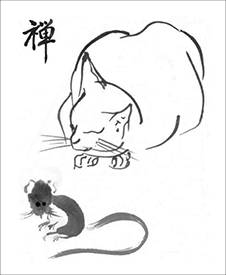 Part One presents Master Sheng Yen’s lively, anecdotal account of the history and main principles of the Chan tradition, along with his careful instructions for meditation. Part Two consists of 180 of his gemlike aphorisms and sayings that serve as inspirations to spiritual practice. The book will appeal to beginners as well as experienced students. In this memoir, Chan Master Sheng Yen traces his spiritual journey against the panoramic story of China from the pre-communist era to the present. From descriptions of the private world of Buddhist masters to first-hand accounts of Chinese history, it is a rare document that is both an important look at China’s past and a compelling spiritual journey across a lifetime. Sheng Yen’s story is of a life lived in the last years of the Republic of China, the Sino-Japanese War, and the founding of the People’s Republic of China. An eye-opening slice of modern history as well as an authoritative introduction to an ancient religious tradition, this book will appeal to spiritual seekers, travelers who want to understand more about China, or anyone looking for a fascinating story. Chan involves studying, practicing, acting, and being, but beyond words and ideas, the true Chan cannot be described, only learned. Under the guidance of authentic teachers like Chan Master Sheng Yen, many students in the West have learned how to follow the path. Collected from a series of talks given during Chan retreats, Getting the Buddha Mind presents the teachings of this esteemed spiritual guide and brings the intimacy of the retreat experience into the reader’s living room. Master Sheng Yen provides an unprecedented understanding of Chan, its precepts, and its practice. 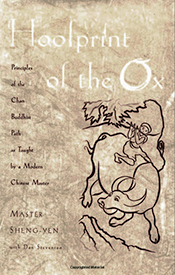 Beginning with a basic overview of Buddhism and meditation, Hoofprint of the Ox details the progressive mental exercises traditionally followed by all Buddhists. Known as the Three Disciplines, these procedures develop moral purity, meditative concentration, and enlightening insight through the stilling of the mind. 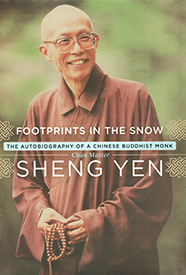 Master Sheng Yen then expounds Chan Buddhism, recounting its centuries-old history in China and illuminating its fundamental tenets. He contemplates the nature of Buddhahood, specifies the physical and mental prerequisites for beginning Chan practice, and humbly considers what it means to be an enlightened Chan master. 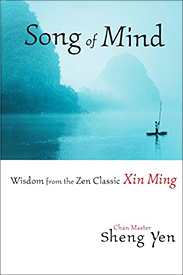 Written while the author was secluded in solitary retreat in southern Taiwan, Orthodox Chinese Buddhism provides a wealth of theory and simple, clear guidelines for practicing this increasingly popular form of spirituality. One of the most influential Buddhist books in the Chinese language, the book explores a wide range of subjects, from distinguishing core teachings from outdated cultural norms to bridging the gap between Western and Chinese traditions. 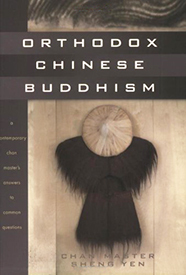 In the process, it addresses such questions as “To what extent should Buddhism be Westernized to fit new cultural conditions?” and “Does Westernization necessarily lead to ‘a dumbing down’ of Buddhism?” In addition to the translation of the complete original text, this edition includes new annotations, appendixes, and a glossary designed for the Western reader. 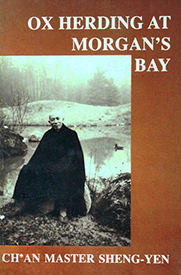 A series of lectures given by Master Sheng Yen during a week-long retreat at a Zen community in Surry, Maine. The lectures are not a scholarly interpretation of the pictures. Rather, they are improvised, informal talks meant to help practitioners cope with obstacles and situations that arise in their practice during retreat. The ten ox herding pictures serve as an inspiration for Master Sheng Yen’s words of advice and encouragement. These talks are helpful for anyone who meditates, whether they attend retreats or not. 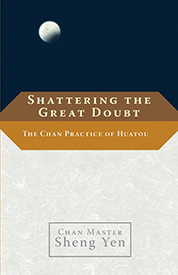 Huatou is a skillful method for breaking through the prison of mental habits into the spacious mind of enlightenment. The huatou is a confounding question much like a Zen koan. Typical ones are “What is wu [nothingness]?” or “What was my original face before birthand-death?” But a huatou is unlike a koan in that the aim is not to come up with an answer. The practice is simple: ask yourself your huatou relentlessly, in meditation as well as in every other activity. Don’t give up on it; don’t try to think your way to an answer. Resolve to live with the sensation of doubt that arises, and it will pervade your entire existence with a sense of profound wonder, ultimately leading to the shattering of the sense of an independent self. Master Sheng Yen brings the traditional practice to life in this practical guide based on talks he gave during a series of huatou retreats. He teaches the method in detail, giving advice for dealing with the typical pitfalls and problems that arise, and answering retreat participants’ questions as they experience the practice themselves. He then offers commentary on four classic huatou texts, grounding his instructions in the teaching of the great Chan masters. 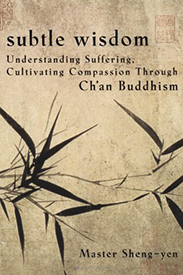 Master Sheng Yen considers the concepts of suffering, enlightenment, and, compassion provides a glossary of key terms; and briefly recaps the history of Buddhism in China. But he goes beyond these issues to discuss contemporary matters and questions he has encountered in his years of teaching in the United States. 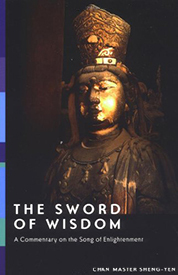 Sometimes personal and always instructive, Sheng Yen’s introductory work is perfect for those just coming to Buddhism, and for those who are already very familiar with the Tibetan and Zen schools. 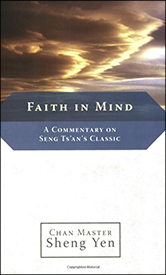 Here is the inimitable Master Sheng Yen at his best, illuminating the ancient texts of the Chinese Zen tradition to show how wonderfully practical they really are, even for us today. 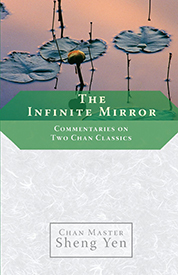 The texts, written by two of the founders of the Tsao-tung sect of Chan Buddhism, are poems entitled Inquiry into Matching Halves and Song of the Precious Mirror Samadhi. Both emphasize the Chan view that wisdom is not separate from vexation, and both speak of the levels of awareness through which one must pass on the way to realization. Both are also works of Buddhist philosophy that can serve as guides to spiritual practice for anyone. Here is a spiritual practice uncomplicated enough for anyone to learn, yet rich enough to be worked with for a lifetime. 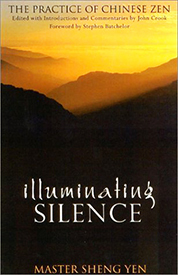 The traditional Chan method called silent illumination begins with nothing more than putting aside all thoughts except the awareness of oneself “just sitting” It’s so simple in execution that it has sometimes been called, as the title indicates, the “method of no-method” yet, simple as it is, the practice is subtle and profound, with the potential for ever subtler refinements as the practitioner moves toward mastery of it. When fully penetrated, this radical form of emptying one’s busy mind-stream leads to perception of the vast ocean of pure awareness. A penetrating commentary on the Song of Enlightenment, a famous Chan text that speaks of proper methods and attitudes for practice. 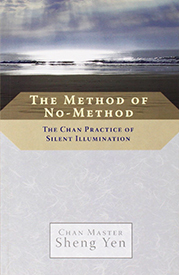 In this book, compiled from a series of lectures delivered during intensive meditation retreats, Master Sheng Yen gives valuable advice and guidance to those who are practicing Chan meditation. 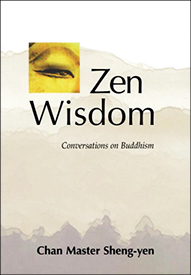 His lucid words offer fresh insight into a timeless philosophy that will be beneficial and inspiring to anyone who is interested in Buddhism. The Heart Sutra, just over a page long, distills the teachings of the Buddha to their purest essence. Perhaps the best known of all Buddhist sutras, it is recited in Buddhist centers and monasteries around the world. Emphasizing a living wisdom directly experienced, the schools of Chan have revered the Heart Sutra for its concise expression of the core realizations of the Buddha. 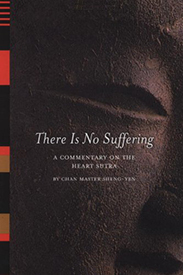 There Is No Suffering is Chan Master Sheng Yen’s commentary on the Heart Sutra. He speaks from the Chan point of view, and presents it as a series of contemplation methods, encouraging readers to experience it directly through meditation and daily life. In this way, reading the Heart Sutra becomes more than just an intellectual exercise; it becomes a method of practice by which one can awaken to the fundamental wisdom inherent within each of us. 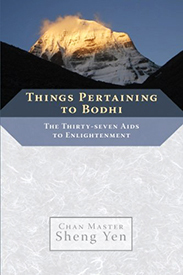 The Thirty-seven Aids to Enlightenment are a set of fundamental Buddhist teachings in the form of a list. The list’s seeming simplicity belies the fact that it is actually a kind of road map to enlightenment for anyone who follows it with diligence and sincerity. The thirty-seven aids comprise seven groups of practices conducive to awakening. Each of the seven groups is itself a list of enlightenment factors, which add up to a total of thirty-seven: (1) The Four Foundations of Mindfulness, (2) The Four Proper Exertions, (3) The Four Steps to Magical Powers, (4) The Five Roots, (5) The Five Powers, (6) The Seven Factors of Enlightenment, and (7) The Noble Eightfold Path. Master Sheng Yen’s down-to-earth teachings take the reader on a progression through each of the practices, illustrating how they relate to the reader’s own path toward enlightenment. 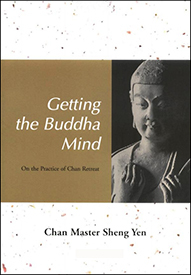 Master Sheng Yen combines wisdom gained from years of study and practice with knowledge of the contemporary world to show how Chan and Buddha’s teachings are still relevant today. Beginners as well as those already on the path will find clear and useful guidance as the revered teacher answers questions from his students on the simple yet elusive principles of Chan (Zen) practice. © 2019 Dharma Drum Retreat Center.